A Bun In The Oven Game Craft! I was so tired of the diaper pin game, so I decided to come up with something new. This game is called the Bun in the Oven game. Everyone receives a dress that looks like a Pregnant Mom. At the end of the shower, the guests are asked to open the dress and whoever has the "bun in the oven" wins. 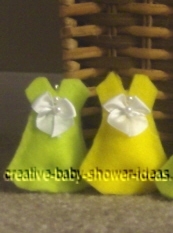 The pregnant mommy dresses are easy to make. 2 pieces of Felt for the front and the back of the dress. Color of your choice. Cut dresses out of the felt. 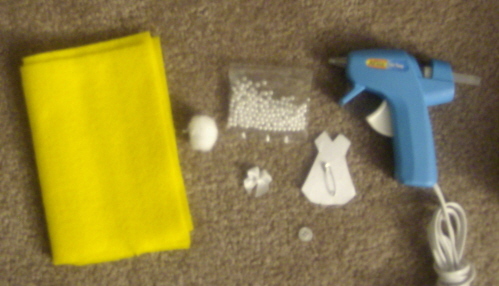 Hot glue the sides and stuff dress with 1 1/2 cotton balls. Hot glue a small pearl and mini white bow onto the dress. Seal the bottom of the dress with one tiny dot of hot glue. Add a safety pin to the back (so guest can pin on their lapels). Place 1 button inside one of the dresses for the lucky winner to find. Easy, very cheap to make, and oh so cute! I love your baby craft game idea LaTonya. It is so unique and fun. I am so glad you shared it with us! Thank you!